The marriage is not merely a physical and legal contract but a sacrament – a holy union between two souls. The spiritual goal of any Sikh is to merge his or her soul (Atma) with God (Parmatma) and in marriage, the couple vow to help each other towards this goal. The early part of the day is devoted to the religious ceremony which almost always takes place in a Sikh Gurdwara (Sikh temple). 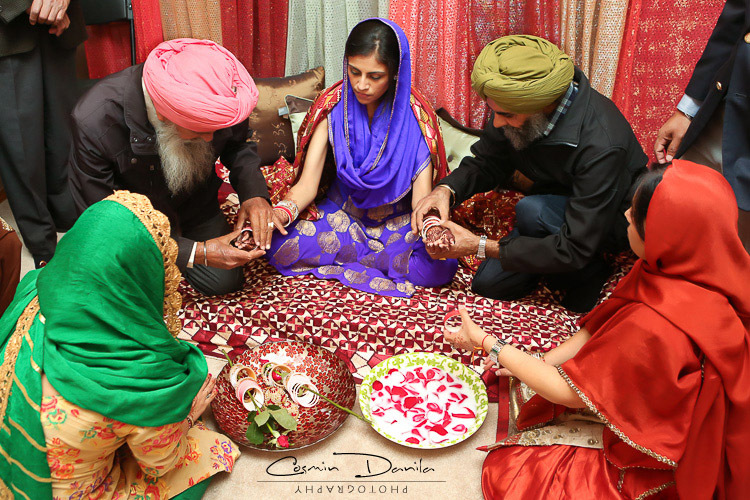 There are lots of Traditional Punjab pre-wedding and post wedding rituals. 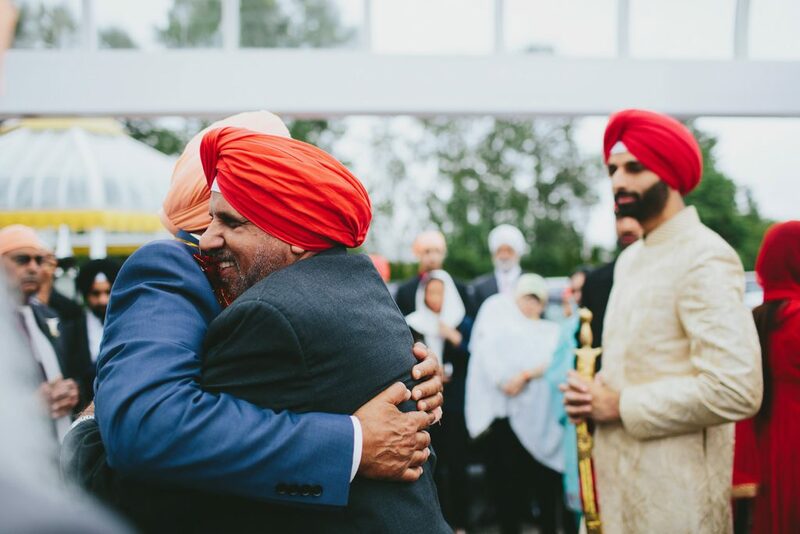 Fun does not stop there, and also traditional Punjabi wedding ends with a grand reception and a tearful Vidaai, where the bride is sent off to her new home. 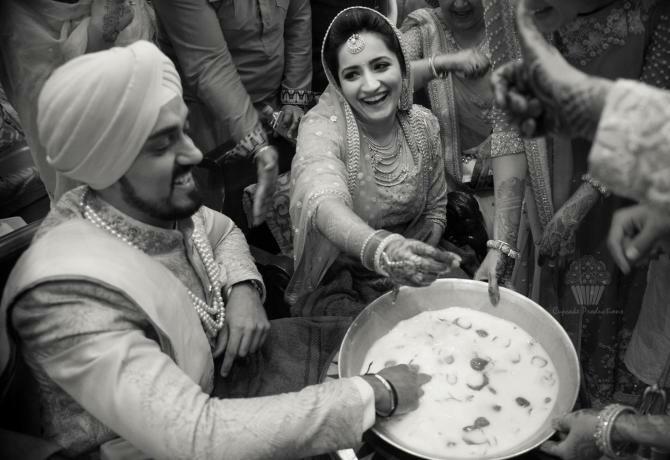 Roka is the first step of traditional Punjabi wedding which means ‘to stop‘ and in this perspective it is to stop the search of partner as the perfect match has been found. 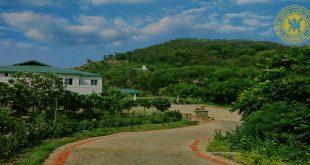 Where meeting of family members is arranged at bride’s home and the groom’s family members are invited to select the girl. After Roka ceremony, Thaka is conceded at bride’s place to set wedding date and preparations are made for engagement. Thaka in Punjabi culture means to ‘set the date’. 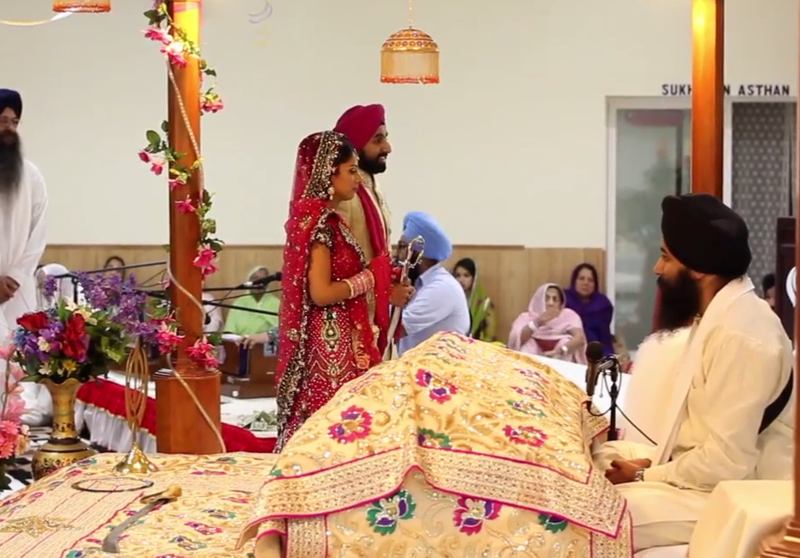 Engagement ceremony in traditional Punjabi wedding is known as ‘Kurmai’. 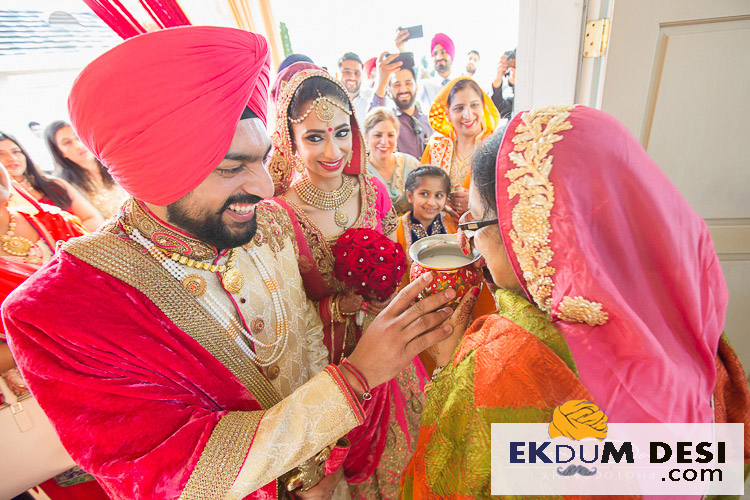 In this Family member of groom presents the engagement ring and the bride’s family members offer Kara (Sikh steel bangle) to the groom. This ceremony is started with a short prayer by Granthi (Sikh priest). 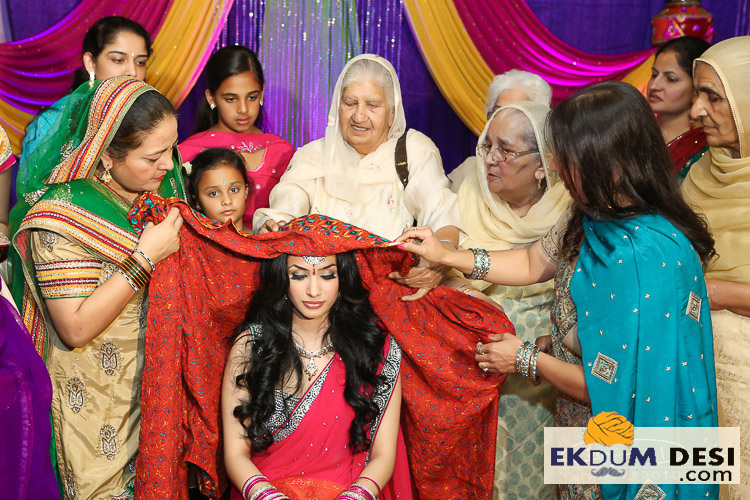 The Chunni Chadai is performed by mother of the groom who covers the brides head with Chunni (veil) which represents that from now onwards she is responsible for upholding the honour and pride of her family. Bride is dressed in clothing and jewelery by her in-laws. Grooms parents offer shagun (sweets) to bride and her family as blessings and acceptance of engagement. Mehendi ceremony is performed before wedding day. 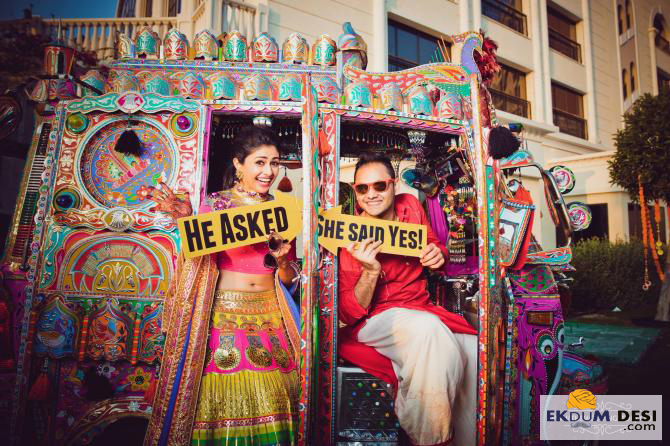 Bride and groom both are adorned with Mehendi, eucalyptus oil, clove oil and lemon juice water. And at same time traditional dholak is played with beats of spoon and ladies enjoy with folk dance and folk songs. 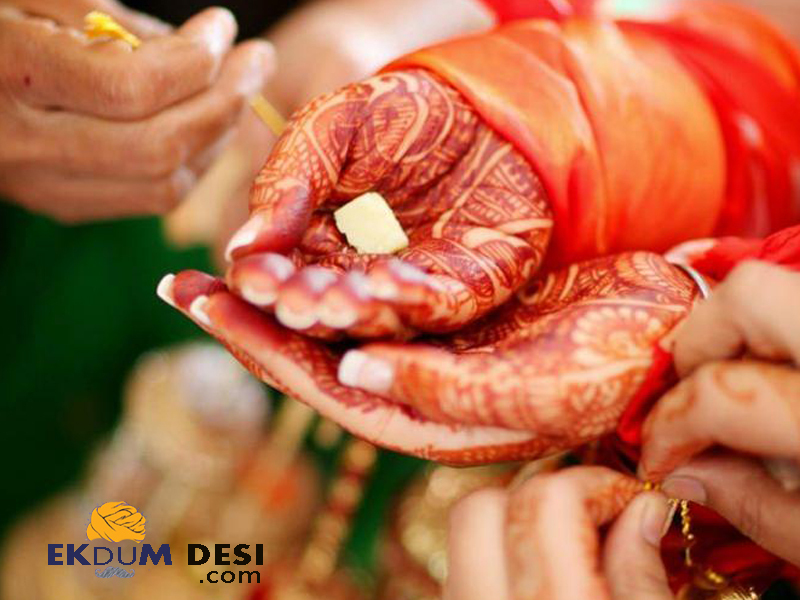 Ladies in the house also apply Mehendi on their hands as it is known as shagun. 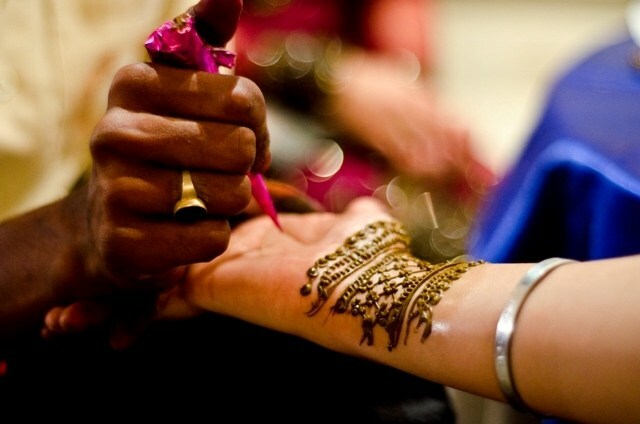 Mehendi is supposed to be symbolizing the love of couple, darker the colour, stronger is the love. In the early morning of the wedding day, the bride and the groom (each in their respective homes), sit for Morning Prayer, where the Gana (sacred thread or mouli) is tied to their right wrists. The Gana tied with as many knots as possible in order to make it difficult to untie later. 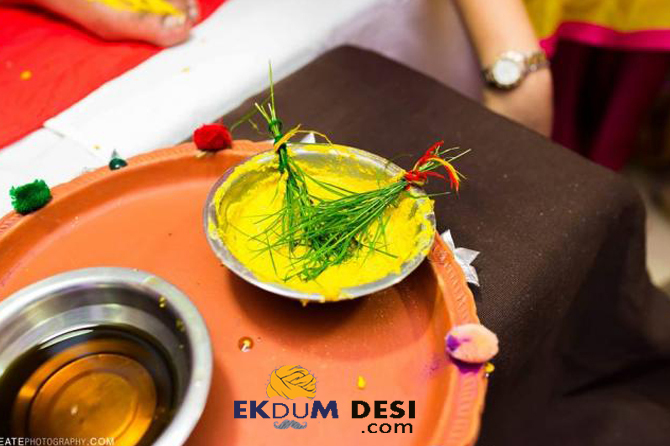 In Punjab Haldi ceremony is known as Vatna and it is applied in early morning of the wedding day. The bride and the groom (in their respective home) sit for this ceremony. A paste of Haldi is applied on their faces and body to get that natural glow at the time of their wedding. 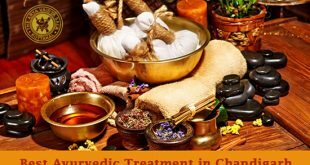 All their respective family members and relatives also apply oil on the bride and the groom’s forehead, and give their blessings. 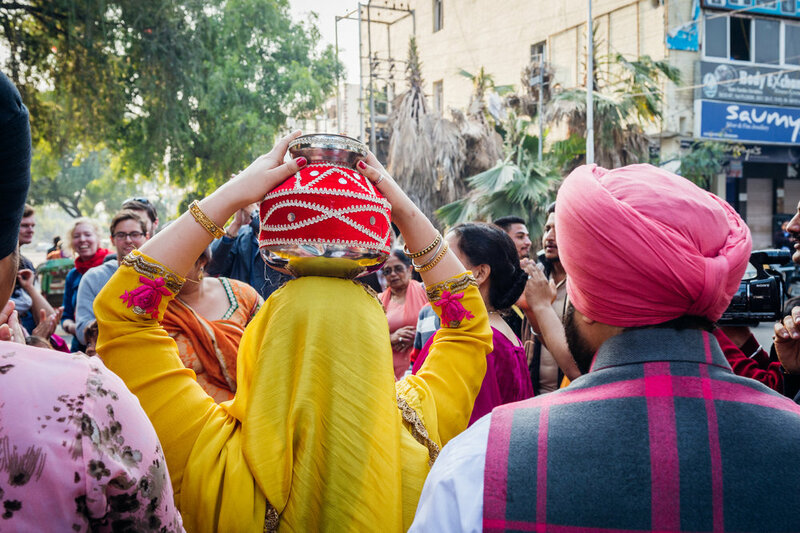 In this ritual, bhabhi’s of the bride and the groom at their respective homes, bring water in a ghada (earthen pitcher) from the gurudwara and the couple is expected to bathe with this water before the wedding. Choora ceremony is performed at bride’s maternal home by her uncle giving her Choora (21 bangles with red and cream color) who are bathed in Lassi and rosewater. Kaliras (silver and gold hanging ornaments) are tied on the bangles by everyone blessing bride. Before leaving the room she touches one of her female friends with Kaliras and it’s been said whosever head it falls next would be her wedding. 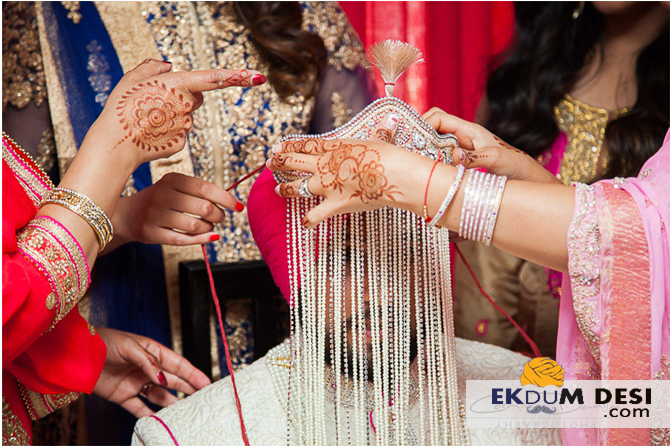 At the wedding day, Sehra (a heavy embroidery veil) is fixed onto the groom’s head which is then tied on turban by the elder sister of groom. This moment is quite sentiment for grooms parents and sister as he becomes a mature and responsible man entering his new life. Lot of sweets and money is exchange. 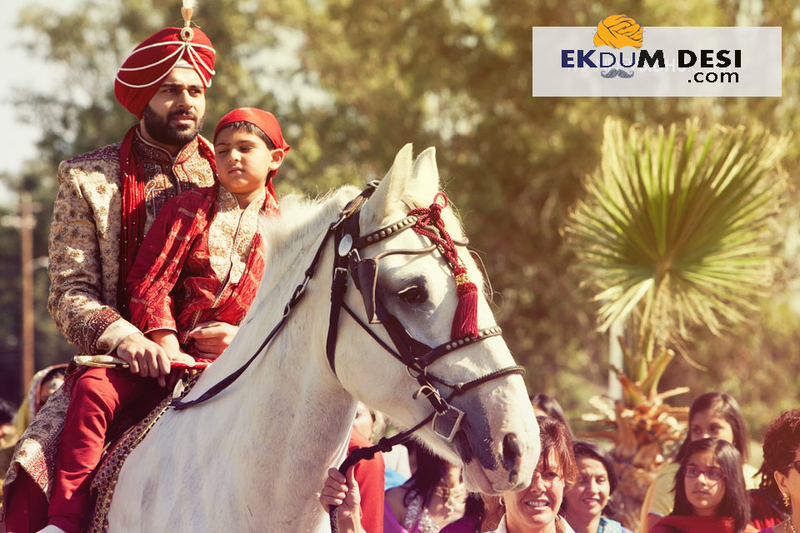 After Sehra Bandi, the groom then climbs on Ghodi (She-horse) and Ghodi is served with Chana Dal. And groom’s sister-in-law adds lines to groom’s eyes with soorma. Traditional Punjabi wedding music and dance is performed by all the family members and they visit the venue of wedding by dancing. After arrival of the groom and his family to the bride’s home, both the families start introducing individuals of both the family members. The foremost family member is greeted with garlands. Milni is performed by priest along with bride’s family member mainly by men. After Milni breakfast is been served to guest before ceremony begin. Anandkaraj is also known as “ceremony of bliss” which starts with Kirtan- traditional singing of hymns. 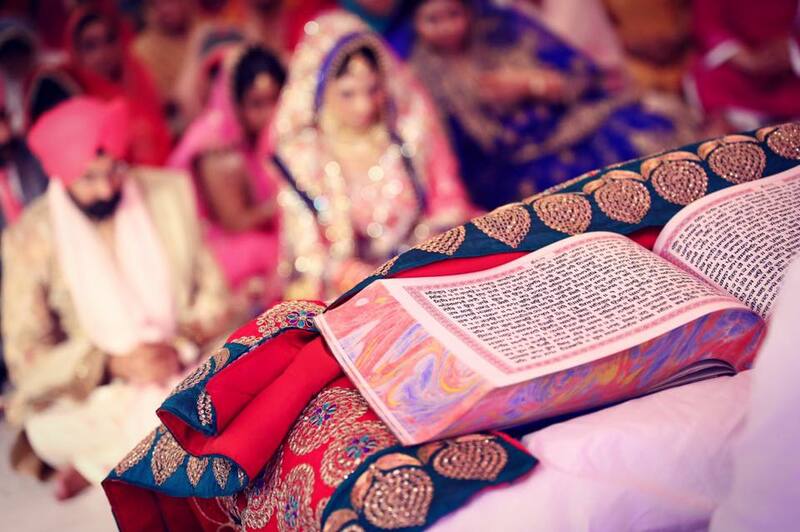 The bride is escorted in by her brothers and uncle while the groom sits in front of the holy book called “Guru Granth Sahib”. After which the couple and their parents are asked to stand for prayers (Ardas). Laavan means the four prayers spoken by Sikh priest from Guru Granth Sahib that seal the marriage. At the time of Laavan, the bride and groom move clockwise around Guru Granth Sahib as Ragis finish the prayer. The couples bow to the holy book and wait for next verse. During Laavan the groom is given one end of Palla (scarf) on his shoulder and other end is hold by bride. This ceremony is ended with final prayer and distribution of Guru Prasad to guest. 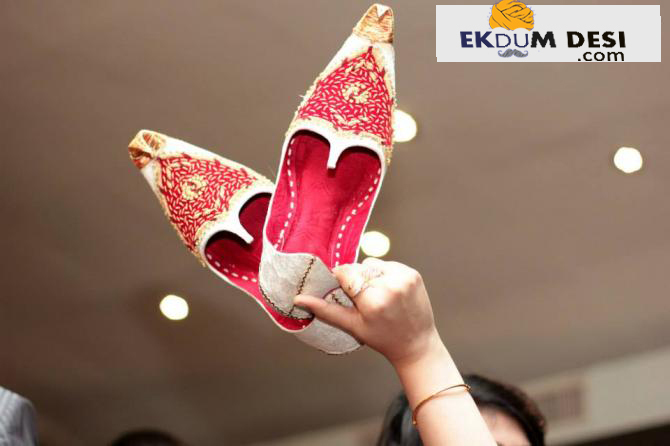 When the bride and groom are sitting at the Anandkaraj, the sisters of the bride hide the groom’s Jootas, and return them later, in exchange for money. The bride sits in a traditional Doli which is lifted by four people; this is very emotional moment for bride’s parents as their daughter is leaving from her home to start her new life. Bride’s mother stands behind her holding a scarf while the bride showers rice all over the room, praying her home to remain happy and prosperous forever and she is escorted to her Doli. After Vidai the newly married couple enters the house where mother of groom apply mustard oil on both sides of the entrance door. Then mother of groom does an aarti of bride with a pitcher of water. After each circle groom’s mother tries to drink the water but every time the groom stops her. She would allow her mother-in-law to drink the water on the seventh count. The bride and groom untie each other’s Gana in the presence of all the relatives. Whoever wins the game dominates in the married life. We would love to hear from you, do comment your view and queries.